Emie Hale documents her skin care journey on social media. Photo by Collin Richie. Emie Hale has used natural oils every day since she was 19. During her senior year of high school, her friends started using them in their hair, putting drops in their food and making their own moisturizers with them. She started researching the various uses for essential oils like eucalyptus, peppermint and lavender, and she, too, began gradually incorporating them into her daily skin and hair care routines. Today, Hale documents her skin care journey and tips on her Instagram. With the help of plant-based products, Hale says she has been able to regulate her oily-dry combination skin. She works full-time as a barista at French Truck Coffee, spending most of her days hustling to make drinks for customers. So she enjoys the moments when she can unwind by taking care of her skin and cook nourishing meals for herself and her husband, Jarrod. 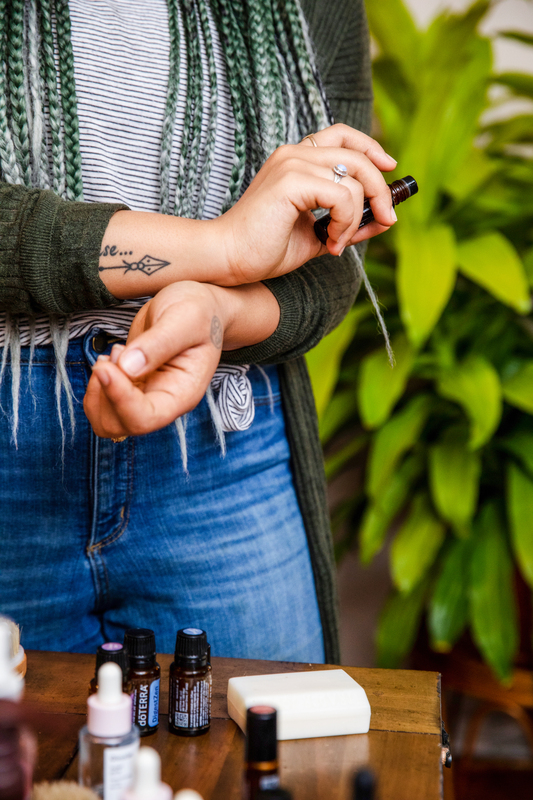 Emie Hale uses roll-on oil blends on her pulse points to aid with anxiety. In the morning, I start with a splash of warm water to open up my pores. I massage argan oil around my eyes and then all over my face and neck. It’s supposed to be good for your lymphatic system. I start from my eyebrows and move my fingers toward my nose to help with drainage. I like to let the oil sit before I do anything else. The act of taking time to take care of myself is good for my skin—and really great for my mental health. For my makeup I use a lot of Glossier, Neutrogena or Almay. I love Glossier’s branding. Their products are pretty clean—not 100% natural, but it’s a lot of plant-based stuff. I like that their product line isn’t huge and how they keep skin care at the forefront. I’ll normally use one or two oils for my whole body. A little bit goes a long way. I’ll saturate my dry brush with a few drops of oil and then start from my ankles and move in small circles all the way up my body. It helps a lot with ingrown hairs and removes dead skin. For my hair and face I’ll use a paste I make. I’ll mix shea butter, Vitamin E oil, argan oil and coconut oil as a base, and then I’ll mix in dry turmeric, peppermint, eucalyptus, cedar wood, myrrh, frankincense, lemongrass and rosemary. I eat a lot of plants. For breakfast, I’ll eat a big salad that’s just greens, avocado, olive oil and lemon juice, or I’ll do a quinoa bowl with an egg. I also like beans, lentils or avocados on toast. I use a lot of turmeric and cayenne in my food. They taste really great and are good for inflammation. For dinner, I eat a ton of veggies, rice and beans or quinoa and veggies. I have a pretty high-energy job, and I work out regularly. I try my absolute hardest to be as waste-conscious and eco-friendly as possible. So a lot of the reason why I use oils mostly is because of the packaging, how long they last and sustainability. I think it’s the coolest thing that you can trust that what you’re putting in your body to help heal yourself was just grown out of the ground. Skin Deep is a 225 series on how locals approach skin care, beauty and wellness. All insight shared is the subject’s opinion, and 225 is not endorsing their regimens. Please talk to your doctor or aesthetician before trying a new product.